Today myself and fellow ISMer ‘Alistair George’ walked over to the Youth Against Settlements outpost on a sunny Hebron hilltop, in the middle of a windy fall afternoon. We expected to interview a recently released Palestinian prisoner, but instead we were greeted with Raed Atrash, a human rights journalist who writes extensively about the rights and plight of Palestinian prisoners in Israeli prisons. He works with Al-Arabiya broadcasting on a radio programme as well, covering mainly Hebron and Gaza occupation-related news. We interviewed him extensively about the condition of Palestinian prisoners, and our translator, nonviolent resistance organizer, Youth Against Settlements activist and ISM co-founder Issa Amro, used the opportunity to talk to us at length about his own political views. I am putting up the interview- which touches on everything from prisoners’ rights, education in prison, prison resistance, media censorship, the Gilad Shalit deal and the Third Intifada- as it occurred, mostly unedited. Life inside prison is organised very well. Every prisoner who is arrested by the Israeli army will go to the prison and he will have to put [align] himself with a party. The responsibility of this prisoner will be on these parties. For each party, there is a leadership committe which organises the life of these prisoners. Prison is divided into many parts, in each part there is a commitee from all the parties which control and organise the life. Inside every part this committee decides laws which the prisoners have to follow in order to organise their life. There is a cultural committee in order to raise the awareness of the prisoners of what’s happening outside and inside to give them the experience to deal with their situation. There is also a management committee to solves clashes between prisoners if something happens. There is a religious commitee which will conserve the right to pray for every prisoner. [There are] rarely [clashes/rivalry between different political groups in prison]. There are a lot of problems between the prisoners and the Israeli management of the prison. They interfere and they try to make problems for the prisoners. They try to interrogate them in the night in order to annoy them and not to create stability in their lives. They also try to strip search them. They try to take the electronic machines which prisoners use – televisions or hot-plates. It’s not easy to continue the life without these things. abilities. The task of this committee is to teach the prisoners how to read and write, simple education. Before 5 years ago the management allowed papers and pens into prison. After Shalit [was captured] they prevent books, pens and paper from entering. There were books in the past but now new books cannot enter the prison. They are allowed now to buy pencils but not new books. [Are any prisoners studying for degrees or taking high school exams?] Absolutely none. Issa – In the past they were letting the schoolchildren take the high school exams but not anymore – not the high schools or even any degrees as a collective punishment for all the prisoners for Shalit. After Shalit was captured they launched a new law (‘Shalit’s Law’) against the prisoners. After he was released everyone thought they might stop Shalit’s Law, to let the Palestinian prisoners study, to let the families from Gaza vistit their family members. Until now, nothing has changed – only the isolation because of the hunger strikes. Raed- Many prisoners volunteer to teach the other prisoners but the main issue is to have a formal education – to have a degree at the end of the education and they are not allowed to do it. They call it self-education, the prisoners teach each other many subjects. It’s continuous and working well – you need education to fill your time, otherwise you will go crazy. Criminal Palestinian prisoners are put in an Israeli civic prison..
Issa – in 2010 I was arrested but they put me with the civic prisoners! This was a form of punishment [for me]. Criminal prisoners are equal to any Israeli prisoners, they have many rights. They have as many rights as Israelis. 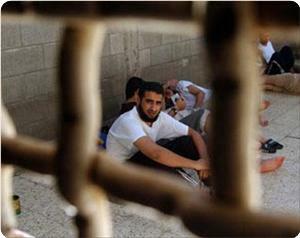 Raed– Around 30% of the Palestinian prisoners are political prisoners; they didn’t participate in any armed resistance. We have more than 250 adminstrative prisoners, around 5% of the prisoners, which is illegal. I [personally] know 10 journalists in jail but there are a lot more. They teach the prisoners about the Palestinian cause in general, about the history of the Palestinian people and the tragedy and teach them many case studies in the world, Che Guevara and these kind of revolutions – the French, Indian, Colombian – to use them as a case study for revolutions across the world. There are many political meetings, debates, discussions among the prisoners to teach them and empower their discussions. For many prisoners this is a form of steadfastness for them and a form of remaining in their cause and supporting their motivations and their willingness to learn more and more. Without this kind of education and empowerment I don’t know if they can survive. representatives in there, a structure, people who negotiate with the authorities, they try to talk to them and convince them. They start with boycotts, not listening, not going for the count, missing meals until they go to the hunger strike. After the hunger strike is the disobedience – they ignore the security completely and they don’t listen at all – which makes it very hard and its not easy to count the prisoners every three hours without their willingness. Issa – Historically nonviolent resistance was very successful inside Israeli jails. Many writers have written about the prison resistance – it’s nonviolent resistance. They got many achievements – they got right to education, to family visits, more TV channels, reading, writing, food – prisoners negotiate about every small detail of their lives. It’s a continous conflict and it’s about who will give up first and usually the prisoners get their rights through many hunger strikes – many people died because of their resistance. If you are strong they [the Israelis] listen to you. Raed- Israel considers children older than 15 as adult – although from 15-18 they put them in a special jail, they don’t want them to let the political prisoners affect them politically. In many countries they have special arrangements for the children that are detained, in Israel they treat them as adults. All the prisoners consider the jail as a school. Prisoners in Israeli jails learns political issues, languages, religion – anything you can imagine. It’s not optional for the prisoner not to study or participate in these courses – all the Palestinian parties/ factions oblige their members to join the educuation system both political and other education. There are some optional courses, which are extra, but the basic education is compulsory. This obligation fulfills the prisoner’s needs, so you don’t have anyone refusing this. Many prisoners go into jail without any political education. When they go in they have a lot of time to study why they are doing this [resisting] and they study thetheory behind their practice. They give them all these case studies and international law, tactics to resist and they share their experience fighting the occupation. Because of the division that happened between Fatah and Hamas, the West Bank and Gaza, the institution that created the unity charter was the prisoners. The prisoners from Fatah and Hamas inside Israeli jails had a meeting and published a unity charter and now all the Palestinian factions are implementing it outside jails. Issa – The prisoners are creative in what they do and they have a huge influence on the outside, this is why you saw all the people were more than happy when the Shalit deal gave them hundreds of prisoners, it was 10% of the Palestinian prisoners but the happiness was much more [than this] as if all the prisoners were released. All Palestinians are united in listening to the prisoners – they see them as holy people, in spite of their political background or agenda. All of them are equal and all of them are heroes in our eyes. Raed- [Is the Shalit deal good?] It’s a very good achievement to release [even] one prisoner. This deal released 315 prisoners on life sentences in Israeli jails and usually they don’t give them a release date – even their bodies usually stay in Israeli jails [after they die], they keep them in special freezers or they bury them in cemetaries – just to punish the families. It was a good achievement. especially to Fatah. Marwan Bargouti will start the third intifada for sure. He’s the only one who can unify Fatah and all the Palestinian factions, everyone agrees on his leadership. He was leading the second intifada and sentenced to six life sentences. It gives him uncountable credit from the Palestinians from all factions. All the factions consider all the prisoners as heroes. If he is already a leader and he is high up in Fatah – this will make him the future President of Palestine. is trying to transmit this poison to his followers. Hate speech in Israel is illegal….I filed complaints. You can’t challenge violence, even with all the evidence – you will not achieve anything in Israeli law [if you are Palestinian] it will vanish in Israeli courts. Everyday in 2008 I went to the police station to make complaints. I went once to the court last year and they found him [a settler] guilty – he confessed that he broke my camera. I had the video to prove that he attacked me. The prosecutor representing me didnt [even] want him to go to jail or to do voluntary work, she just wanted to send him to the behavioural officer where they tell him ‘how come you let him film you doing that, next time don’t leave evidence’ – this is the behavioural officer! To file complaints to the same authories that are violating the law – it’s useless. Raed- [What motivates him to work with prisoners] It’s my patriotic duty, my national duty. I am supporting human rights and the prisoners cause is a human rights case, it’s not even a political thing. 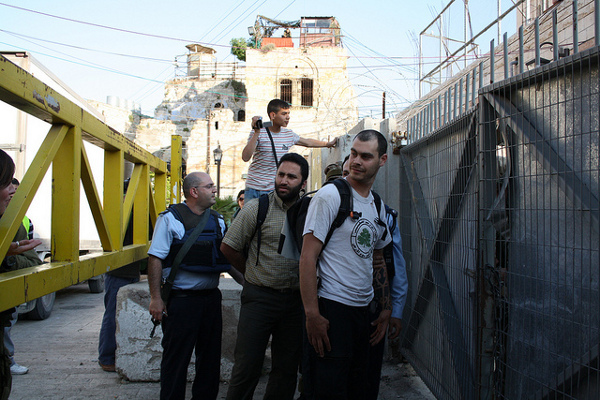 I have been in jail in 2009 for six months for ‘incitement’ against Israel, through my work. Issa – If he was in a political party or in a poltical movement they would not accuse him of incitement – as a journalist or an activist these are the only charges that they can use. They use it for many other Palestinian activists and journalists. Raed- When I was released, one of the intelligence commanders told me ‘I hope not to listen or hear you on the radio again’. I work with 10 radio [stations] now! During the investigation they showed me the timetable of my programmes and they were following my media programmes. community. They want the community to be without a leader, without a guide. All the Palestinian leaders, in spite of their ideology, are a target for the Israeli security in a different way. If you are within the law they put you in jail according to the law – I was accused of incitement and it wasn’t a mistake – it is a systematic way to kill any voice against the occupation. Take Abu Mazen’s step to go to the UN [bid at UN] it is a completely nonviolent step, he is allowed to do it according to international law, and they can oppose him politically, not to threaten to destroy Ramallah or the West Bank or to cut the money. Because the international community is silent. The Israeli security forced are the real terrorists, not us. Raed- I was once in the studio giving my programme – I was live – and the Israeli forces came and stopped the programme and raided the radio station and detained me for an hour. This is normal for the Israeli security. There is more harassment when I am out working in the field; they detained me many times. I was detained at one of the checkpoints after I participated in the journalists forum election. They detained me for 2 hours even though they knew I am a journalist and I showed them my ID as a journalist. Issa – You are a terrorist in spite of any identity you have. All the Palestinians are terrorists – this is how they treat us. We are all Bin Laden! This is how they try to show us to the world. Raed- [On media coverage of prisoners/Shalit] – The international media covered the Shalit case and put him equal with 6000 Palestinian prisoners. Some media agencies ignored the 6000 and only mentioned the victim who was Shalit, and the majority of the Palestinian prisoners are political prisoners and they didn’t participate in killing Israelis, however Shalit was inside a tank [as part of an occupying force that killed people], he was captured from his tank, not from his house, or his city or his school or his university. The Palestinian media was talking about him as a normal prisoner and telling him that he should be treated according to our Islamic culture and that he should be safe and treated well, not as happened to our prisoners in Israeli jails who are suffering daily. Issa – All of the big international media agencies are biased, all of them are pro-Israel and pro the Zionist movement and even they lie and manipulate and they hide a lot of obvious facts. We use social media [to get past the media agencies], it’s our method to teach all the people in the world what’s happening. [On being challenged] – let’s say that all international journalists are either pro-Israel or neutral. I see the neutral people as biased – when you see violations, when you see oppressed people and you are neutral, you are biased and participating with the oppressor. I meet many journalists who are pro-Palestinians but they are a tiny amount compared [to pro- Israelis]. I’m not against Israel by the way – I am aganist the occupation! This is very important – if you are against the occupation, it doesn’t mean that you are against Israel – on the contrary, if you are against the occupation you are going to protect Israel in the long-term. No solution [to the occupation] doesn’t help Israel. cause, I think he is pro-our cause but I don’t think he thinks his country’s interest is with our cause. This is when we will reach our freedom, when our cause will be connected with the national interests of the UK, Sweden, USA, China, Russia – it’s about politicians, not about pricnciples, morals or anything like that. There are many good people in Israel who want to live in peace and love with the Palestinians but they are controlled and hidden [by the media].